hip hip Hoera! : How to make an upcycled gift box? How to make an upcycled gift box? Recently I found out how to easily create a gift box, using tetra pack. Tetra is a material that everyone has at home: it is the packaging of your juice or milk or many other nourishments. And you will probably throw away many of these packs weekly, without thinking of what a beautiful material this is. Tetra often has a wonderful silver gleam on the inside and an always surprising print on the outside. You probably know the little purse made out of tetra tutorial, that is circulating on the internet. This is an awesome way to upcycle a tetra pack, but you can do so much more with tetra. For example: create a shiny little gift box. 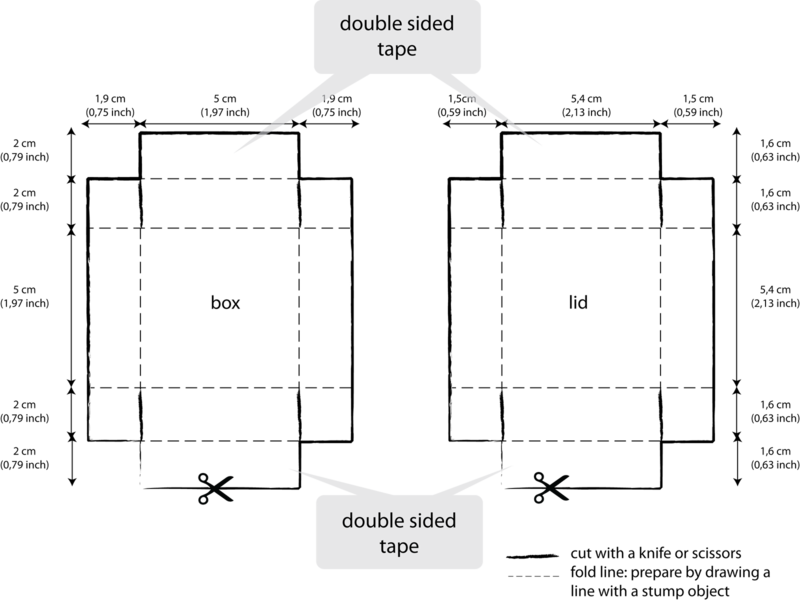 Below I describe how to cut and fold a basic box and a lid out of tetra. How to decorate it, that is up to your own imagination. Follow the steps to make your own! 1. Before you cut open your tetra pack, make sure that you clean it: pour some water in it, shake it (repeat ones or twice), then cut open the pack and rinse it again with water. 2. Dry it carefully with a towel. 3. Choose which side of the tetra should be on the outside of your gift box. In this example I choose to have the grassy print with the cows on the outside. 4. On the other side (the side that you want on the inside of your box) you draw with a pen the lines along which to cut or fold. For the dimensions, see the drawing above. 5. Use a cutting knife or scissors to cut out the two shapes, both box and lid. 6. Use a stump pencil (or any other object) to draw lines along the dashed lines to prepare for folding. 7. Put double sided tape on the indicated area's. 8. Fold the little faces inwards, and cover them with the faces that hold the double sided tape. Et voilà! Your gift box is ready. (Variations: Put the silver coloured side of the material on the outside and decorate it with ribbons, embellishments, thread, anything that comes to your mind. Or make a tiny little box by adjusting the dimensions, with just a little calculation extra.) For more examples of boxes and tags made of tetra, visit my Etsy shop.